I was in much need of a break from my overseas work, and we’re entitled to two 2-week vacations during our 10-months away from home. Since I was already halfway around the world, it didn’t make sense for me to go back to Canada when I could see so much more on the other side of the Atlantic! Where to go? I looked at Seychelles, I thought about Thailand, I even considered Turkey. Dean, a longtime friend of mine mentioned it has always been his dream to climb Mount Kilimanjaro, so I started googling. I learned that Kili was a mountain that anyone in ‘reasonable physical condition’ could handle, and I thought: I’m in reasonable physical condition! So on the spur of the moment, I searched around, emailed some travel companies and finally came up with a plan of what I wanted to do and see in Tanzania! I finally settled on a combination of Kili climb, Serengeti Game Drive and R&R in Zanzibar. As soon as my trip was booked, I ordered everything I would need for hot and cold weather and mountain climbing from Mountain Equipment Co-op and prayed that my order would make it from Canada to the southwest asia on time! I departed Dubai on the 28th of August. My gate didn’t open until about 1045pm, so I had about 40 minutes to wait before I could check in my bag. I was amazed at how smooth and quick the check-in process at the Dubai Airport is compared to Canada. Security was a breeze. The clerk at the check-in asked me where I got my PacSafe locking wire mesh I had on my backpack and told me it was good that I have it for this flight. This made me a little nervous. I had never been to Africa and was travelling on my own. I managed to pack everything I would need for a mountain climb and another week and a half of adventure into one hiking rucksack. What an adventure this is going to be! The flight to Nairobi was very nice, and the Precision Air flight to Kilimanjaro was nice and short. We flew right between Kili and Meru (I think). I have put myself in a bit of a pickle. I was only able to get Dirhams and then hoped to get $$ in Nairobi, but time was a bit tight and I didn’t get any. I didn’t have enough U.S. Dollars for my visa when I arrived and I had to change Dirhams at such an outrageous exchange rate. 100DH = $14US. I’ve been hosed. Now I have no idea where to get any money. There were three others on the ride from the airport to Springlands Hotel. Danilo and Chris are brothers from Brazil who were celebrating Chris’s 40th birthday by climbing together, and Beth a young British girl, who, like me decided 3 weeks ago to climb a mountain. 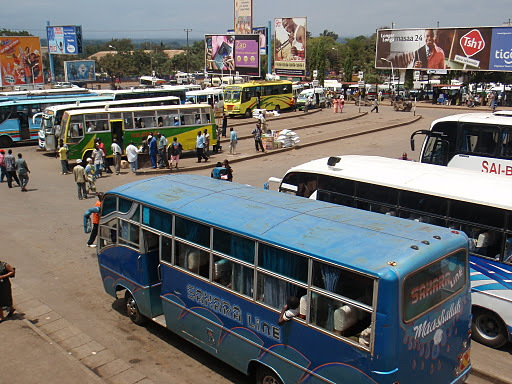 We hired a local, whom we nicknamed Shingo and he took us into Moshi. 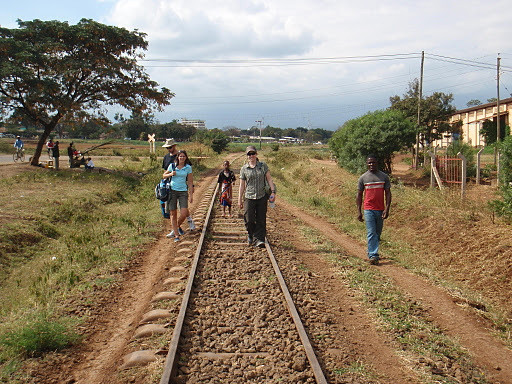 We went to the bus station, police station, all the markets and walked back on the railroad tracks and through a tiny village between Moshi and the hotel. One of the things that really impressed me about Tanzania so far was in an area of the world where religion truly divides, the mosques and churches sat across the same town and for the most part, Moshi and I would soon learn the rest of Tanzania is relatively peaceful. The people in the town I spoke to were rather proud of this fact. While the others were shopping, I asked Shingo about school He told me that school is very expensive and to go for two months it costs $50. He wants to go back to school to learn more English. I told him ‘practice makes perfect’ and he knew that phrase! It suddenly dawned on me, watching every Kenyan on that flight from Dubai try to open the plane bathroom door but unable to read the instructions. They may make enough $$ to fly, but they are illiterate in both English and Swahili. As we were wandering around Moshi, guys all over the place were trying to sell us stuff. One guy made a comment about buying from the shops vice the ‘community stores’ and supporting drug lords etc. It makes one stop and wonder: where is any of the $ spent here REALLY going? Who is benefitting from my visit here? Uneducated, illiterate men? Or something bigger?